I have some time off for the holidays, so I’ve got the top glued up. This took three days to accomplish. I put together a long ripping jig to to get a straight edge on all of the boards. I had an old oak shelf with a machined edge on it, and I used a couple of scrap blocks screwed to the board. I could then screw through the blocks into the edge of the boards to hold them while I ripped a straight edge on them. I made sure to have the top up on one edge and down when cutting the other edge. This way if my saw blade was off a little the boards would still fit together nicely. This worked pretty well and I didn’t need to run next door to have my friend edge joint them. I glued up the top in two sections. It did require a bit of clamping pressure to bring the edges together, so I made sure to let the glue dry a full 24 hours before unclamping them. Thus the three days to complete this task. I used painter’s tape along the glue joints to minimize cleanup from drips and squeeze out. This worked well and the glue did not seep under the tape edge. 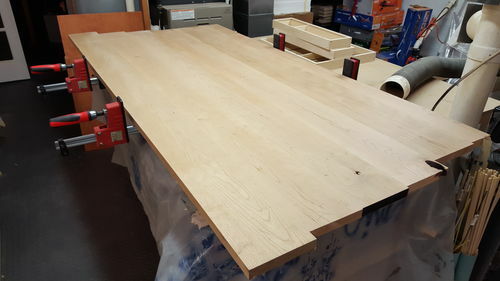 I did need to borrow a couple of 4’ clamps for the final glue up (it helps to have neighbors who are also woodworkers). 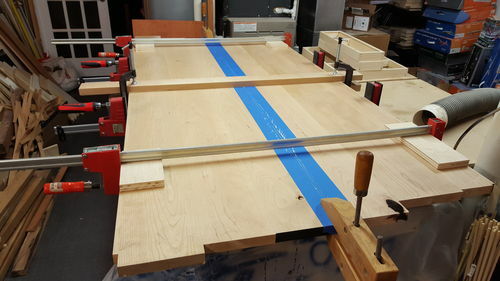 For all the glue ups, I used some scrap boards with clear packing tape and clamps to keep the joints flush. This worked pretty well and I was able to clean up all the joints with my RO sander. I do have one small knot hole in the middle of the top that I’ll fill with epoxy and filler stained dark brown. Next, I used my circular saw to cut the ends of the top square. 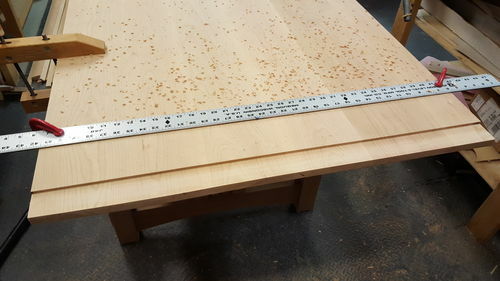 The overall dimensions will be 36” wide and 68” long after the two 4” wide breadboard ends are attached. With a straightedge clamped to the top, I routed the tenon that will fit into the end pieces. I milled the breadboard ends and started routing the mortise, but my router made a horrible noise and the 3/8” spiral up cut bit spun out of the collet! Luckily the end piece wasn’t ruined, but the bit left a larger hole than planned. This also happened on the test piece I used while setting up this cut. I thought I just didn’t have the collet snugged down enough, and made sure to tighten it before starting on the real piece. The bit has been used, but I didn’t thing it was that dull. Have I damaged the collet on my router? Looking at cut, the bit must have been trying to climb up as I cut and as it did the slot it was cutting got wider and wider. Like the bit was not spinning straight anymore. Anyhow, I ordered a new bit and it will be here in a few days. I ‘ll double check my router and see if I can see anything with the collet. In the meantime, the plywood to finish the drawers showed up, so I glued them up and mounted the hardware. 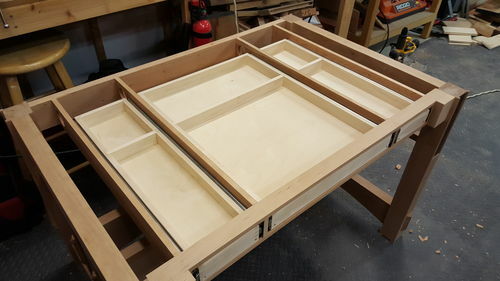 Two of the drawers fit a little tight, so I’m going to run them through the table saw to shave a little off. That’s going to be one nice desk. Breadboard ends are a pain, but I’m sure they will come out great. 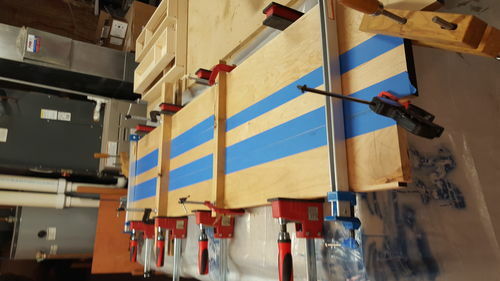 Some nice tips on the glue up. I plan to use them for my next table top. desk will be a challenge because the pieces are pretty large. I do have a 12 inch planner and an 8 inch joiner so it should work out. unsure of cross members and uprights. At this point I think I’m going to build a mock up out of some extra plywood I have.